Ad Mare has an extensive repertoire list, and we are always happy to be exploring new works. We perform pieces from the Classical and Romantic periods, World Music, and 20th Century works. These include European, British, French Expressionist, American and Canadian compositions. 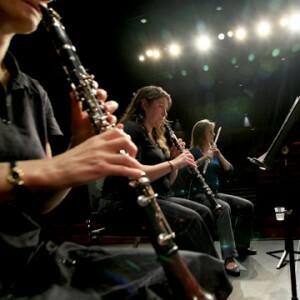 We have also performed various sextets that have been composed for wind quintet and one other instrument. Ad Mare takes a special interest in Canadian compositions and has performed music by local composers James Beckwith Maxwell, Colin Macdonald, Benton Roark, Jennifer Butler, Jordan Nobles, Christopher Kovarik, Tudor Feraru and John Baker. The group has also presented other Canadian composers such as Jacques Hetu, Claude Vivier and Rodney Sharman. We were excited to be able to commission a new work from Vancouver’s Cam Wilson, entitled Huapango, which was premiered to critical acclaim in 2007. In October 2006, in conjunction with a Vancouver educational arts sponsor, we presented our first quintet composition contest that took place at Eric Hamber Secondary School. Four young BC composers answered the call for submissions for a short work, based on a popular theme that would be judged in front of a high school audience. 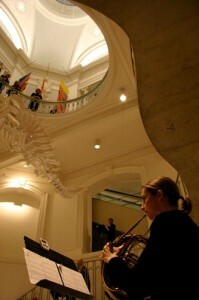 The winning work was performed at our educational concerts in the Spring of 2007. The event was a great success and introduced students to both the compositional process and to the instruments and techniques of the quintet.